Hi, everybody! Your favourite corvid, Joe Crow (that's me! ), is back again. I can't wait to tell you all about the exciting couple of weeks we've been having here in The Land Of The Thunder Dragon. So I'll get started! The Fourth King's picture is on the left. 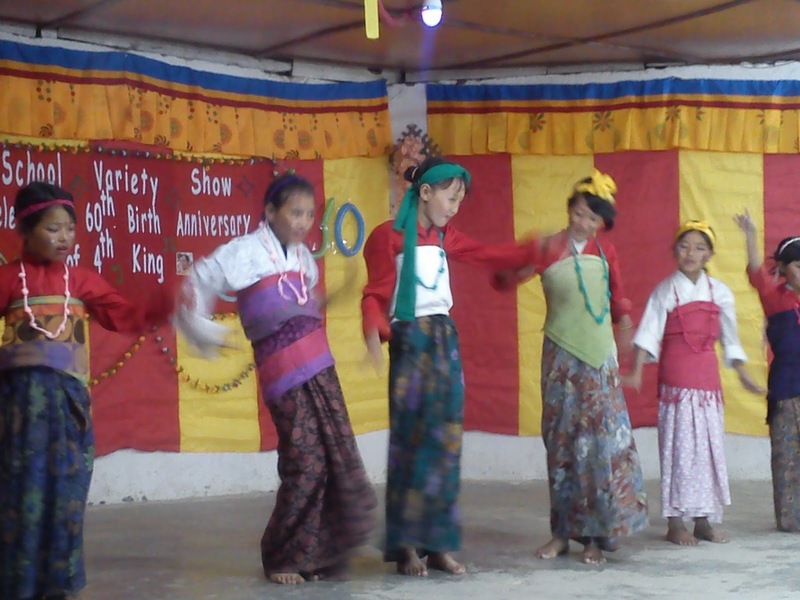 I don't think I've mentioned this before, but this year is a very special one in Bhutan. It marks the 60th birthday of the Fourth King of Bhutan. He might not be the king anymore, but the Fourth King is still very, very popular here. This is because he is seen as being responsible for many improvements in the lives of people in Bhutan. So, to say Kadrinche Miwong Chog (Thank You, Your Majesty), people all across the country have been partying, celebrating, singing, dancing, playing sports, organising competitions... and doing many, many other enjoyable things! The young king in 1974. 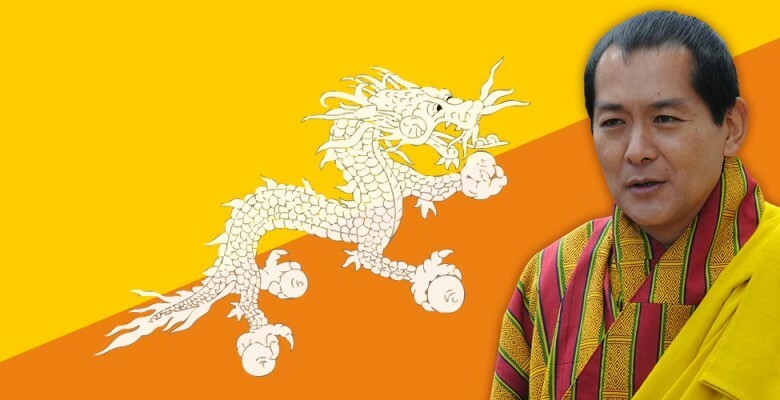 The Fourth King of Bhutan, called Jigme Singye Wangchuck, was born in 1955. When he was still a prince he even went to school in England – at Oxford University! He became the world's youngest ever king in 1972, when he was just 17 years old. Wow... That's a lot of responsibility for a young man! The thing that makes Jigme Singye Wangchuck so beloved by the people of Bhutan is how he helped change the country for the better. In 1972, there were very few roads in Bhutan. There were also no proper hospitals and less than ten schools. There were no phones, and no electricity in most of the country. Some places in Bhutan were so difficult to get to, you had to walk for several days through the forest. So many people barely left their villages. By the time he stopped being king, in 2006, the situation had changed completely. Now there were three big national hospitals and many smaller ones dotted across the country. Every child could go to school, for free, and most homes and villages were connected to an electricity supply. People were much less poor than they were before, and he even introduced the idea of voting for the government. Bhutan had managed to achieve all these things without damaging its beautiful forests and wildlife, and without hurting traditions. (See my blog about GNH for more information on this!) You can see why people want to Jigme Singye Wangchuck a happy birthday! We had a variety show evening to celebrate as well. Perhaps the best moment for everyone present was when the current (fifth) King of Bhutan, who is Jigme Singye Wangchuck's son, announced in his speech to the country that he and his wife are expecting a baby! I'm sure that news was a very happy birthday present to his father. FUN FACT! The King of Bhutan is called Druk Gyalpo in Dzongkha. ANOTHER FUN FACT! In Bhutan, 2015 is called the Wood Sheep Year! A Surprise For Class I! Hello friends, Joe Crow here. I hope you're all well. As you know, I've been living in Bhutan since January. I've seen many exciting and interesting things, and learned a lot about Buddhism, schools and the country. You can see the snow on the mountains. But most of all I have been working my feathers off trying to help the children at Samey Primary School to learn English. My friend, Mr. MacInnes, has been helping a little bit. I think we're doing a good job, and the children are so much better and happier talking English to me than they were at the beginning of the year. They are proud of themselves too! It's the end of October now, and it's starting to get pretty chilly here in Dagana. Winter in Bhutan can get very, very cold indeed. That is because it is a mountainous country. When you're living at higher altitudes the weather gets much colder. In the high mountains of the Himalayas, the temperature can get as cold as -20°C, or colder! Dagana is in the southern part of Bhutan, which is hotter than the north, but as Samey is quite high up it gets very cold at night. The daytimes are still quite sunny, but in the shade it can still be cool. When there is no sunshine, it really is cold! So, as we're moving into winter now I've started wearing my new winter hat in the evenings! I'm also keeping my nest well padded with old feathers to keep the wind out. Mr. MacInnes is making more use of his winter jumpers too! Me and my new winter hat! New Zealand is the country coloured red. The thing that worried me was weather the children had enough warm clothes for the cold winter months. Quality winter clothes can be hard to come by in this part of Bhutan, especially as some of the families don't have much money to buy clothes with. But – and this is really exciting – I made a new friend who sent a special surprise for the children in Class I! This friend is called Kia Ora (which means hello in Maori), and she is a Kiwi bird who lives in a country called New Zealand! She saw my blog about Class I and really wanted to do something to help the children! Isn't that kind? So Kia Ora sent a special package, just for the children in Class I. Inside it were lots of useful teaching aids, like flashcards, books, pencils and more. She even sent plenty of information about New Zealand, so the children can learn about her home too. But most importantly, she sent them all a set of nice warm clothes for them to use in the winter! They were very happy! Most of them wore the new clothes the very next day! Have a look at the photos of me giving Class I their gifts. We were very thankful to Kia Ora and to her friends in New Zealand! That's all for this time, friends. I'll be back again soon so we can compare Bhutan and New Zealand! Altitude - The height of something above sea level. Mountainous - A place having many mountains. Hi there! Joe Crow here. How are you? I've been keeping very busy lately, the rains are slowly stopping and I've been out looking for as many small frogs as I can eat! There are lots of them around at the moment. There are also lots of tasty, sugary fruits on the trees too. The human children here love to pick and snack on them. But did you know that sugar – yes, even the natural sugar that is in fruit – can be very bad for your teeth? If you eat too many sugary things or keep them in your mouth too long, the sugar can make holes in your teeth. These holes, also called cavities, can be very painful. 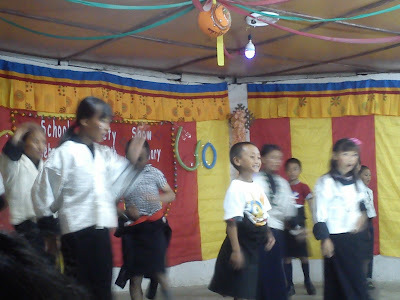 Here in Samey, the children are no different from children all over the world. They love sweets and chocolates! There's nothing wrong with that of course, but it can cause those problems if you don't look after your teeth properly. Unfortunately, when a dentist came to visit our school, he found that many of the children do have problems with their teeth. There were some cavities, and many children had to have teeth removed because they had become rotten. This made me feel very sad for the children. It is especially sad if this happens to your 'big teeth', the new ones that come when wobbly teeth fall out. These big teeth are permanent, which means you will have them forever. If you have one taken out, you'll never grow another one back. Crows don't have teeth, but I'm always careful to keep my beak clean and shiny! It should be the same for all children with their teeth. You need to brush your teeth with toothpaste twice a day, and make sure you brush each tooth! Sadly for some of the children at Samey Primary School they have difficulty being able to get toothbrushes and toothpaste. Also, some of them have not had much experience learning about how to look after their teeth. But thanks to my good friends at Pashley Down Infant School in England, we have a new project called Bright Smiles! Every child at Samey now has their very own toothbrush! Also, the school has lots and lots of toothpaste as well as many replacement brushes for when the children need to change. 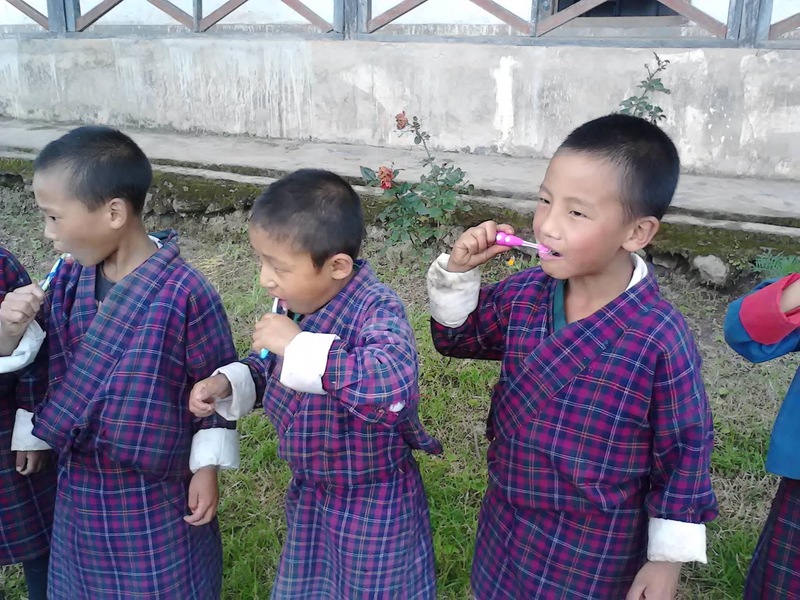 The kind children and parents from Pashley donated toothbrushes which were sent in the post all the way to Bhutan, as well as some money to buy toothpaste. My teacher friend, Mr. MacInnes is making sure that all the children learn how to brush properly and take care of their teeth. He invited a dentist to come and give a special workshop to the children and to show them the best way to brush. Each child keeps their toothbrush in the school and brushes their teeth at least once during the school day. Hopefully they will continue to have bright smiles for a long time into the future! They look really happy with their brushes, don't they? Speak to you soon, and remember to keep your teeth clean and bright! Summer in Samey... It's always pretty foggy! Hi friends (both the feathered and not-so feathered ones)! I'm sorry I haven't written in such a long time. It's been very difficult for me to fly anywhere lately, and I've been having a tough time getting on to the internet. Let me explain why! Summer arrived in Bhutan, the Kingdom Of The Thunder Dragon, in June. Normally I love summer! All my birdie friends are out and about, singing in the trees and having fun in the sun. I bet you like it too! No school to go to... Sunshine... Ice-creams... Beaches... Well, in Bhutan it's a little bit different! Secondly, and worst of all, summer in Bhutan is really the monsoon season. The 'monsoon' basically means the rainy season. Yep, it rains a lot in Bhutan during the summer. Even more than in England! The rain is extremely heavy at times too. Some of the children have to walk for a long time in the rain to get to school. Some days they turn up for their morning study soaking wet, with no dry clothes to change into. I feel very sorry for them on those days. I hate having wet feathers. The rain causes more problems than just wet clothes though. Because the rains can be so heavy, or last for days at a time, they cause landslides as well. A landslide is when lots and lots of soil or rocks slide down the side of mountain or cliff. The rain makes the soil loose and heavy, causing it to slide down. This can be very dangerous and people can be killed by the falling rocks and mud. Luckily I haven't heard of any injuries in this part of Bhutan this year. However, Mr MacInnes has been stuck on the road a couple of times because it was blocked by big rocks! On the right are some photos of the children of Samey Primary School helping to repair our road after the rain washed away lots of soil. There were big holes so no cars could get up! So that's why I haven't been flying about and able to write my blog posts lately. Also, there's quite a lot of mosquitoes out there in the rain... I'm not a big fan of those little biters! Don't worry though. Bhutan is very different from October - March, and there is hardly any rain at all. Then the land and the grass get very dry and there is a lot of sunshine. If you ever want to come to Bhutan, September and October are the best months, then February - April time. Then you'll avoid the wet summer season, and the veeeeery cold winter season! Have a look at the photos below comparing the dry and wet seasons. Hello! Welcome back to Joe's Journal. It's holiday time for teacher's in Bhutan. They have two weeks off school in the summer before term starts again. I've been flying all over the place and meeting lots of interesting people (and birds!). I live in the south west of Bhutan, in Dagana. But Mr. MacInnes and I are holidaying in Trashigang, which is in the east. See if you can find it on the map below. I flew all the way, but Mr. MacInnes had to take a bus - for three days! The bus went round and round all the mountains, up to the top of some and down to the bottom again. I could see amazing waterfalls and rivers as I flew above it. Bhutan really is a beautiful country. Some of the great views on the way to Trashigang. 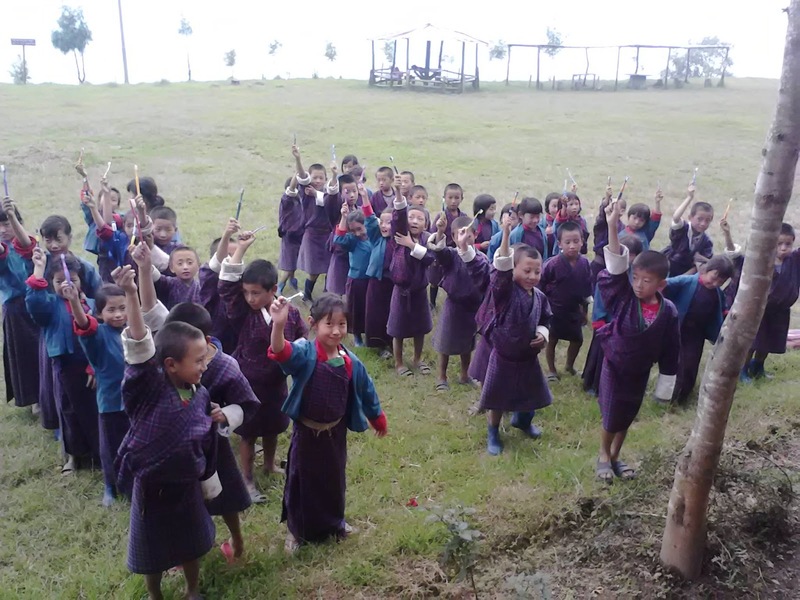 While I have been here in Trashigang, I realised that I've been so busy squawking on about my adventures that I have hardly told you anything about the most important bit - the children of Samey Primary School! After all, they are the reason why Mr. MacInnes and I are in Bhutan in the first place! I love having a teacher as a pet, because I get to meet so many wonderful children! That is especially true here in Bhutan. I help Mr. MacInnes in all of his classes, but I always have the most fun in Class 1. The children in Class 1 are usually about 6-7 years old. They are just starting to learn English and they find it very tricky. I am trying to help them with their phonics, just like you learn in school. They like practising all the sounds they know and blending them together to make words! We get to read lots of books, and if the children find the reading hard Mr. MacInnes talks to them about the pictures and asks questions about what they can see. Let's meet the children, shall we?! This is Pema. She is always smiling and she loves to sing and dance. She likes bananas and flowers. Seday is a quiet girl but she always tries hard to speak English. Her favourite fruit is pineapple and she likes dancing too. She has a sister in the class called Dechen. 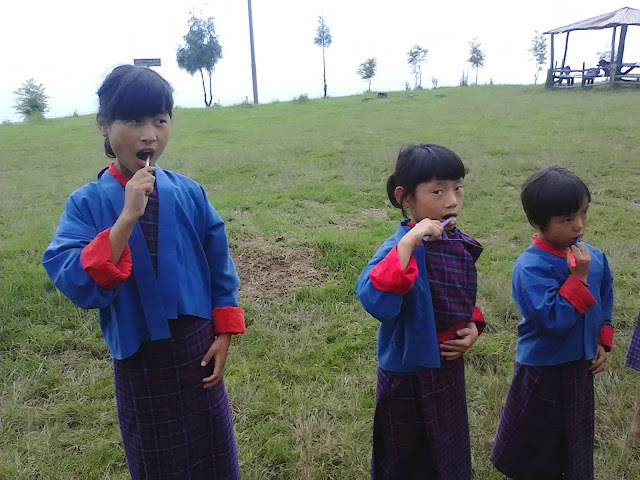 Tandin Wangmo is a very clever girl! She is quite new to Samey and came from a different school, but she made lots of new friends quickly. She likes my silly jokes! Lhaba Dorji loves football! He is starting to get much better with his handwriting too. This is Dechen. She is very quiet and quite shy, just like her sister Seday! She is very well behaved and likes animals. Tshoki is a great reader and is getting better everyday at speaking English. He likes it when I fly around the classroom or do something silly! He is small but he can play football very well too! This is Tandin Tshering. His favourite animal is an elephant and he likes drawing pictures. He always laughs when I'm being silly in the class! Sonam Choki is a very smiley girl - as you can see in the picture! She has to walk a long way to school everyday but she is always trying her best, even when she is very tired. Well done, Sonam Choki. Sonam Jamtsho likes games and sports. He is getting better at his reading and always likes to be the first one to have a go at something new. Tshering Choki is a good friend of mine! She always tries to hug me! She is getting very good at reading and listening to instructions. Well done! Passang Dorji is another boy who loves football, and another one who plays very well! He is very good at speaking English and his handwriting is lovely. His favourite animal is a fish. This is Kinley. He is always happy to see me in class and he enjoys singing and games. Sonam Lucky is another good friend of mine! She is very good at drawing and reading, and can speak English very nicely. She is getting better everyday! Chogyal is a very kind and polite girl, always smart and well behaved. She loves apples and flowers. She is trying very hard with handwriting and reading. So, now you have met my friends in Class 1 at Samey Primary School. They are all very interested in what school is like in the UK (and other countries!) and would love to hear from you. If you would like to ask them any questions then you can email them to Mr. MacInnes or comment below! Maybe you'd like to know about their family life, what they play, what their homes are like, or maybe you would like to share some things about your school! Just remember to ask a grown-up to help you, and please don't post any photos to the blog. If you want to share photos with the children you can get a grown-up to ask Mr. MacInnes. Until next time, Tashi Delek!